The Youth Department of Northeastern Mindanao Mission is actively doing a yearly activity initiating a program that helps the young people become better equipped using their abilities, talents and skills for the leadership in the church. 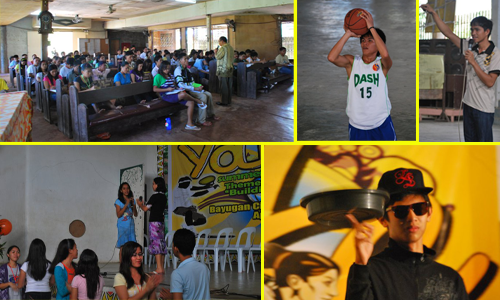 Last April 10-16, 2011 the Youth Department of NeMM headed by Ptr. Max Dante B. Obbus, Youth Director conducted a Mission-wide youth program in Bayugan Comprehensive High School, Bayugan City which called “YOUTH LIFE”. A balanced program instituted to meet the needs of the youth’s physical, mental, spiritual, emotional and social development. A.Y Programming – Printed programs were introduced intended for AY only good for 2-3 years. Young people will just follow and select the activities so that the AY programs become lively and attractive to young people. Youth Evangelism – Youths were trained in the mechanism on how to win souls for Christ. If all our youth involve themselves in evangelism, many souls will be brought unto God’s kingdom. Youth Literature Evangelism – Some of the youth grouped themselves to participate in evangelism through printed pages. They were trained why and how to spread the “Good News” of the Lord through literature. Medical Training- Youths were given several steps and procedures on rescue operation. Sports; a) Basketball, b) Volleyball men, c) Volleyball women – The liveliest portion on the part of the young people is the sports like different ball games. Every player enjoyed very much as well as the spectators. Week of Prayer – The whole duration of the week’s program is a Week of Prayer. Pr. Solomon V. Mongaya, the NeMM president, is the speaker during morning and evening devotionals to help them spiritually developed. Nightly Presentation – Every district’s delegates were given a chance and privilege to show their talents every night which gave a lively and colorful attraction to the affair. Lecturers: The lecturers were Cirilo S. Ba-al, Treasurer, Pr. Bernabe C. Caballero, Jr., Executive Secretary, Pr. Bernabe M. Dahunan, Bayugan District Pastor, Jacinto R. Martinez, Area Publishing Ministries Supervisor, Surigao City. Pr. Jerry T. Taguno, Barobo District Pastor, Pr. Ralph A de Domingo, Cabadbaran District Pastor, Pr. Nimrod V. Saramosing, Health Director, Samson H. Andrade, Publishing Director, Mrs. Leonor P. Mongaya, Womens/Children and FLM Director and Pr. Heshbon Buscato, the SPUC Youth Director. The youth took advantage of the activities and were divided into groups to attend different stations. Almost every district participated on the program. More than 2,000 young people participated the activity and during Sabbath services the attendance was doubled. Praise the Lord for all the youth who have attended on this kind of activities for now they have the means to improve their skills and abilities in the leadership and winning souls for Christ as they go back to their own churches.